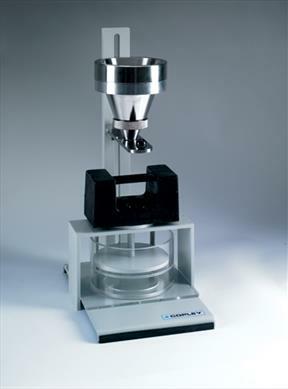 Shear cell methodology is widely used in the pharmaceutical industry to determine the flow properties of fine grained powders and bulk solids and how they will behave in bins, hoppers, feeders and other handling equipment. The test is based on measuring the force required to shear a circular disk through a prepared sample of bulk material. The sample is first subjected to a consolidated load such that the bulk density of the material can be determined – ideally, this should be similar to the loads experienced by the material in practice. The acrylic disk sealing the bottom of the test cell is now removed and load steadily applied to the test sample by pouring sand thought a funnel into a container of appropriate proportions until such time as the sample fails (shears). The results are expressed in terms of bulk density, shear strength and , if appropriate, estimate of the device outlet required.